From 8 September, the maximum draft - or depth in the water - will be cut to 39ft (11.89m), which may affect up to 20% of traffic. A similar restriction was imposed for the same reason in 1998. The authorities say a further cut could be imposed on 16 September if the situation does not improve. The authority has taken the action because water levels in the Gatun and Alhajuela lakes have fallen as a result of the El Nino weather phenomenon. The current draft limit is 39.5ft, which will be cut to 39ft on 8 September and then potentially to 38.5ft on 16 September. Shipping companies had been warned the cuts could be coming. 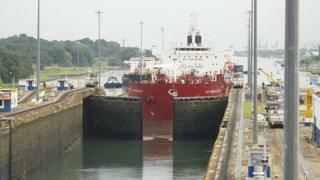 The Panama Canal celebrated its 100th anniversary last year, having seen more than a million ships pass through. Panama took control of the canal from the US in 2000, and has since been widely praised with the way it has handled the operation. Transit fees now bring in about $1bn (£645m) a year for the government.